Inequality in Britain is on the rise. Does this matter? Should we be bothered that the rich give proportionately much less than the poor? And that only a small minority of the very wealthy are giving generously? Ninety per cent of NHS trusts are restricting routine operations. Youth unemployment is at record levels. Meanwhile, those on the Sunday Times Rich List have increased their wealth by 280 per cent since the turn of the millennium, amidst press reports of massive tax avoidance. For the first time in living memory, children cannot expect to be as well off as their parents. Wealth and privilege is under scrutiny. Giving is Good for You demonstrates that growing inequality and poverty is a threat to everyone – even the wealthy – and that the most unequal societies are the most dysfunctional, unhealthy and violent. 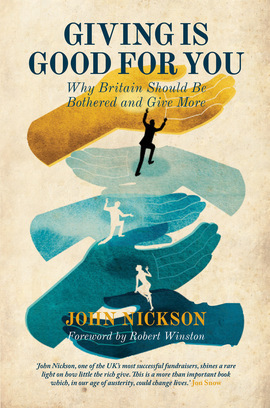 The generous minority are urging their peers to follow suit, arguing that in addition to enhancing public benefit as public spending falls, giving can be personally fulfilling, particularly for those who realise that money is not the key to human happiness. Is giving good for you at Christmas?